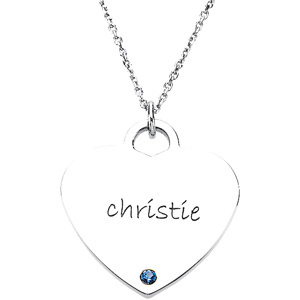 This polished 14kt white gold heart pendant features personalization for 1 name and a corresponding simulated birthstone. Item size: 23mm x 24mm [the size of a quarter]. Each birth stone is 2.0 mm in diameter and gypsy set. Engrave up to 9 characters. Chain not included.